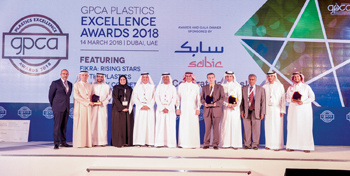 Sabic, United Accredited Company (UAC) and Borouge were among the major companies which were honoured with key GPCA Plastics Excellence Awards at the recently held 8th GPCA Plastics Excellence Awards. The winners were announced by the Gulf Petrochemicals and Chemicals Association (GPCA) at the award ceremony, which took place at the Oberoi Hotel, Dubai, on the sidelines of the 9th GPCA PlastiCon. The ceremony opened with a speech by Abdulrahman Al Fageeh, executive vice president, petrochemicals, Sabic. Sabic and UAC won the award in the ‘Joint Development or Improvements of a New Product, or Application – Resin Producer and Plastic Converter’ category for their PET FIBC (Polyethylene Terephthalate Flexible Intermediate Bulk Container) production start-up in Saudi Arabia. UAC will be the first producer of PET FIBCs in the world. This initiative illustrates how technology partnerships between resin producers, machine companies and converters create new business opportunities for the region, GPCA said in a statement. Borouge was awarded in the ‘Innovative and New Plastic Products and Processes’ category for its AnteoTM-Borstar Bimodal Terpolymer LLDPE. The technology is unique in combining smart catalyst design and a superior process (two-reactor system) with two comonomers giving superior flexibility in polymer design. Sabic also received a notable mention for the ‘Best Sustainability Initiative in the Plastics Conversion Industry’. Meddad Abderrahmane from Sabic Plastic Applications Development Center (SPADC) was named the ‘Best Researcher in Plastics and Plastic Conversion’ for his work in polyolefin products development. The special student category award titled ‘Fikra: Rising Stars of the Plastics Industry’ went to Mousa Alqarni and Khaled Abdullah from King Saud University.